In April 2011, as a pilot project for a larger research in September, Young Women for Change interviewed 20 female teachers and students about street harassment. Eighteen women reported that they face verbal assault daily, and 14 said they had also experienced physical harassment, including groping, pinching and slapping. However, this is not the only reason harassment is common in Afghanistan. 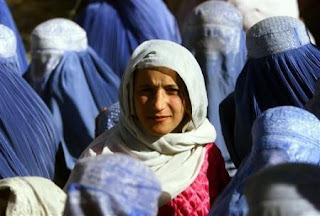 Governmental regulations to restrict women's behaviour and clothing - such as the proposed Wedding Law that would require women to dress "modestly" at weddings - encourages the people, who think like the Taliban and believe women should remain in their homes, to harass women as they exit their houses. They use women's so-called "inappropriate clothing" as an excuse for assault. This approach causes street harassment to be identified as a reaction to the wrong done by women, which leads to blaming women for the assault. Despite being listed as the worst country for women by a Thomson Reuters Foundation expert poll, Afghanistan is not the only country where women face street harassment. According to Stop Street Harassment, "80 to 100 per cent of women worldwide face sexual harassment in public." So far, no coordinated action has been taken by the government, namely the Ministry of Women's Affairs or the Ministry of Culture and Information; by the media; or by civil society organisations to recognise the phenomenon as a social issue that needs to be addressed. Individual women have developed their own methods to fight street harassment. To deny the satisfaction of accomplishment to the violators, many women adopt a silent attitude towards the harassment they face. The silent treatment is a common way women choose to protect themselves and discourage the person who verbally abuses them. Another way of dealing with this problem has been initiation of the harassment by the women when they say something condescending to men, in order to prevent their harassment and to prove that they are not afraid of men's presence. Some women have verbal fights, or mini- fist-fights that usually end with the interference of an outsider. To start this movement, Hadia-Afghan Youth Volunteer Group for Social Reform and Young Women for Change (YWC), an organisation working for the welfare and empowerment of women, have initiated Advocacy for Dignity, a march against street harassment on Thursday, Jul. 14. Members of YWC and Hadia hope that this campaign will be the beginning of a dialogue about street harassment and advocacy against it and that men, rather than the women victims, will be held responsible for their disrespectful behaviour. This demonstration, which is expected to draw dozens of youth from across the city, is the first of its kind in Afghanistan. The majority of the participants in the campaign will undoubtedly be women, but many young men have also expressed their interest in the event. We will gather in front of Kabul University's main gate at 3:00pm. In addition to advocacy through the walk, Hadia and YWC members have invited Afghan and international media to contribute in raising awareness, and to recognise street harassment of women - both as a violation of their human rights and as an issue that discourages women from social participation. *Noorjahan Akbar is currently teaching Afghan children in orphanages to write creatively under a project called Stories to Heal. Noorjahan is also the founder of women's advocacy organisation Young Women for Change and a member of Hadia-Afghan Youth Volunteer Group for Social Reform.